Throughout his life, Bernard Waterman has used lessons he learned at the Missouri School of Journalism and hard work to acquire numerous television and radio stations. At 87 years old, in 2009, Waterman remains active in his company. As a child of the Great Depression, Bernard Waterman has worked for everything in his lifetime. Waterman was born in a small town in the Shenandoah Valley to a father with two disparate careers: He managed a limestone company and performed as a concert violinist at the Philadelphia Symphony Hall. After his father passed away when he was 13, Waterman’s mother raised him and his three siblings. Journalism first entered Waterman’s life when he joined the Navy during World War II. He walked into a naval office in the Pacific that read “newspaper” on the door and asked if he could work for them. They asked him to write up an article about an obstacle course, which was a new invention in those days. “I had never written a story in my life,” he said. “I found someone who knew what an obstacle course was and went out and did this thing on my own.” One month later, Waterman returned to the island and saw his story on the front page. All throughout his naval career, Waterman took correspondence courses supervised by professors in the States. After the war ended, he knew he wanted to attend college and was accepted to several universities. “I had read enough about Missouri to know that was the place to go,” he said. After making the decision to attend the School, Waterman and his wife, Edith, jumped on a train with $1,200 in their pockets-all the money they had in the world. 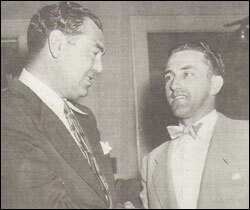 Bernard Waterman (right) with famed boxer Jack Dempsey. Waterman credits the Navy with allowing him to attend college, but he credits God, his wife and the Missouri School of Journalism with his success in life. “I owe the University of Missouri and Ed Lambert whatever I have in the world today,” he said. Waterman took 22 hours of coursework all year long to earn his bachelor’s degree in three years. As a junior, he walked into the Columbia Missourian and asked if he could write for the sports section. Waterman took every opportunity he had at the School. While in Columbia, he pursued work as a correspondent for the Kansas City Star and the St. Louis Star-Times. He also broadcast play-by-play for the Big Ten and worked for KFRU, hosting a sports show with Don Faurot. “I had to walk across Stephens at 11:30 at night and would get whistles from the ladies,” he remembered. After completing his undergraduate degree, Waterman decided to enter the broadcasting sequence as a master’s student. Television was in its infancy, and the School did not yet have a television station. 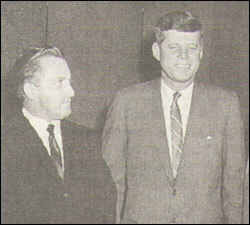 Waterman with President John F. Kennedy. Waterman began teaching classes under Ed Lambert, as Lambert’s first teaching assistant. Waterman and his wife became good friends with Lambert and his wife. After a recent dedication for the Edward C. Lambert Innovation Endowment at the Donald W. Reynolds Journalism Institute, Waterman received a surprise letter from his mentor’s daughter, saying that she remembered Waterman from when her father talked about him when she was a little girl. Before he could complete his master’s degree, Waterman took a job as a sports editor at the Copley Press in Springfield, Ill., where he wrote and continued announcing play-by-plays. “I wasn’t sure which I would be most entertained with, or if I could do both newspaper and broadcast, so I accepted a position where I could do both,” he said. While at his first job, Waterman’s interest in broadcasting continued to grow. He eventually accepted a full-time position at a local NBC station. Although Waterman is first and foremost a journalist, he became a businessman as he began to acquire more radio and television stations around the country. 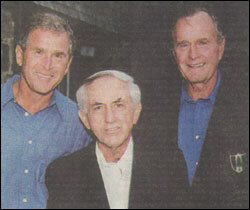 Waterman with Presidents George W. Bush and George Herbert Walker Bush. Waterman says he currently has around 200 employees working for him, about half of whom work in the news department. Although he oversees the business aspect of his company, Waterman still keeps his nose in the news. He watches headlines stream in from around the country and world every hour through the Internet. Throughout his journalistic career Waterman has met scores of celebrities, sports figures and presidents, including track athlete Jesse Owens, and has become friends with former President George W. Bush. One of his most memorable encounters was with Sen. John Kennedy. Waterman was living in Massachusetts, and along with six other people, decided to invite the senator to discuss whether a Catholic could become president. The group met with Kennedy for several hours in a little Greek restaurant next to one of Waterman’s radio stations. 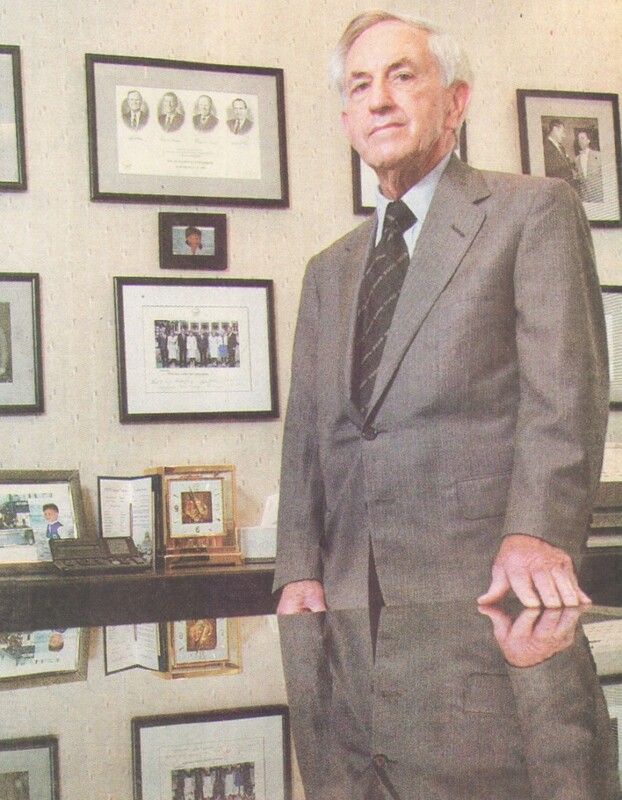 Waterman still has Kennedy’s photo in his office. Waterman has worked hard his entire life, though he says he owes much of his success to the University of Missouri. But he believes nothing can come without hard work.